It is said that a dear child has many names and so it is with Red Cabbage or Rødkål/Surkål as we call it in Norway, where this delicacy is usually served with pork, lamb or beef. Thanksgiving day, at our home in Michigan, we have rødkål/surkal with our turkey dinner and it is always a roaring success. It gives our Thanksgiving meal a delicious "Norwegian Viking accent". My family and friends always rave about how well this lean, sweet and sour cabbage dish compliments turkey. Why not serve this delicious surkål with your next Thanksgiving meal and be a little Norwegian too. 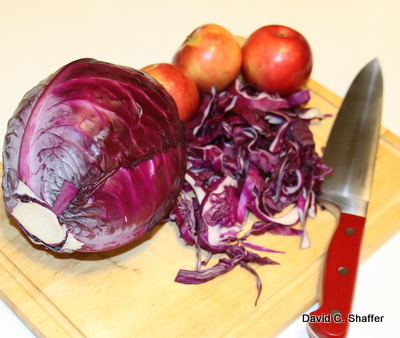 1 medium red cabbage, sliced. 1-2 tablespoon sugar or to taste. 1-2 tablespoons apple cider or vinegar to taste. Place ingredients in a pan with water and bring to boil. Place lid on pan, turn heat to medium and simmer for 10 minutes. Remove lid. Continue simmering until water is evaporated. Taste to see if you need a tad more sugar or honey and you're ready to serve. This dish gives a wonderful accent to Roasted Pork Tenderloin. Rødkål can be made a day in advance and will freeze well. Click here for more about Foods of Norway.